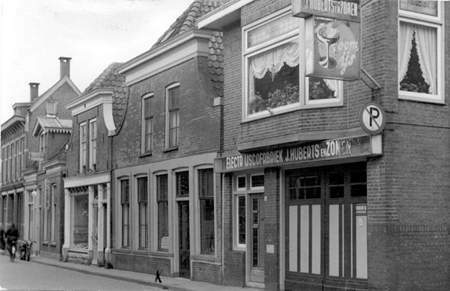 Before and during WWII there was a boarding house at 26 Molenstraat, where a number of Jewish ladies resided. The landlady was Frederika Wolff, born on 21 July 1902. She was one of the three children of Eleazer Wolff and Schoontje Denneboom. Frederika, a tiny woman with frizzy red hair, married Meijer Kan, son of Israël Kan and Esther Wolff. The couple also had a daughter: Frouke Naatje. Meijer was in the rag and scrap trade and had his business in Bloemendal. After his early death Ko de Jong took over the business. He died on 18 April 1930, 27 years old. In great haste he was taken to the hospital in Zwolle, but it was of no avail. His body came back to Meppel in a truck. His wife was pregnant and gave birth to a daughter, Esther, on 27 June 1930. Mrs. Kan probably ran the boarding house to earn a living. Meijer Kan died at an early age. He was buried in the Jewish cemetery on Steenwijkerstraatweg. The boarding house was a grand house. The front door opened on to a low corridor. A room with two windows was facing the street. This was the lounge for the inhabitants, where they could socialize. On the first floor there were three windows facing the street. I lay in my garden and slept. And write a poem for Greta. Page from Esther Kan’s poetry album. On 30 January 1942 Esther moved only for a short while to 27 Ploegstraat in Amsterdam. Possibly to her father’s sister Frouke Naatje and her husband Abraham Osnowicz, who lived there. On 25 September (!) she came back to Meppel, however. On 5 May, the yellow stars had just been handed out, aunty Fré with the star on her coat, sat in the living room of my parents' house in Noteboomstraat. She paid a visit to my parents and was crying, saying: ‘I will certainly be carried off. Will you keep some things for me?’ my mother refused. Later on I saw the children of another neighbour of Frederika’s cycling on little Esther’s bicycle. Apparently they had offered to keep things for them. Mother and daughter were deported to Auschwitz together on 6 November 1942, where they were killed on 9 November. The sisters Grietje and Hester Wolff both lived in this boarding house. They had founded the shoe polish factory in nearby Nieuwe Kerkstraat. They were still alive when the war broke out, but were no longer active in the business. Hester was born on 21 March 1865 and Grietje on 4 May 1868. They also had a brother, Jacob, who had also been employed in the factory. 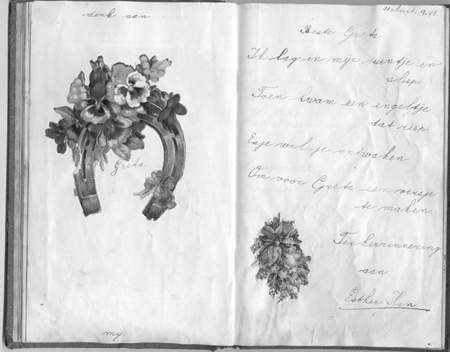 Their father was Meijer Levie Wolff (1830-1895) and their mother was Helena Weijl (1826-1905). The sisters have never been married. They lived for years in a house on Emmastraat, but in 1937 they moved to the boarding house on Molenstraat. Grietje died on 3 February 1942, at eight o’clock in the evening. Fortunately she was spared deportation to Eastern Europe. Hester moved after her sister’s death to Soembastraat, but after a few months she came back to Molenstraat because she did not like it. Not for long, because she too was transported to Westerbork, when the boarding house was cleared. From there she was deported to Auschwitz on 26 October. She died on 29 October, 77 years old. 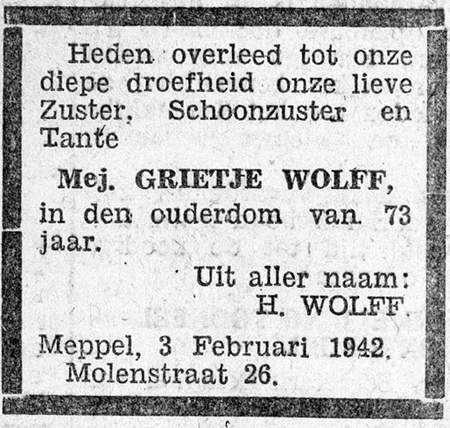 Grietje Wolff’s obituary notice from 1942. Geertruida Frank also lived in the boarding house. At the beginning of the war she had reached the respectable age of 90 and was the oldest Jewish inhabitant of Meppel. She did not yet live in the boarding house then, but at 44a 2nd Hoofdstraat with the Sanders family who also had paying guests. Before that she had lived in Woldstraat, in Emmastraat and on Maatkade. Geertruida was one of the four children of Mozes Frank and Jentien van Rhijn. Her father had a butcher’s shop in Woldstraat under the name of Fa. M.J. Frank. The undersigned announces to his honoured customers that again he has managed to bring with him from Amsterdam some exceptionally big and fat cows, one of which will be slaughtered today, Saturday night, and is to be seen by everybody on Sunday. He will be pleased if you grant him your favour and recommend him. At first his four children (Jacob, Philip, Clara and Geertruida) helped him in the business, but when he died in 1901 they took over the business. A striking detail is that none of them would ever get married. As was usual in Meppel, they had a nickname: after their father Moos they were called the ‘Mousjes’. Jacob was in charge of purchasing, Philip of sales. About Philip (Finie) the following anecdote is going round. Sometimes, when Finie appeared in the street with a box of meat, a naughty boy would shout: ‘Finie, what do you see?’ ‘a bird, dad’. Finie pretended not to hear this and soon the fun was over. Mr. Bloksma told us that the story had its origin in the fact that Finie used to look at a pretty young girl in stead of doing his job. One day the father got angry and asked: ‘Finie what are you looking at? ’The startled Finie answered: ‘a bird, dad’. Betsy van Esso was a dreamy child and often paid no attention during classes. When her teacher had told the story of Balthazar Gerards one day and then asked Betsy who had killed William of Orange, she answered still in a daze: ‘Gerard Glazer, Sir.’ This caused great hilarity of course and Betsy was wide awake again. Lena was taken to Westerbork together with the other ladies from the boarding house and stayed there till 10 November. They may have had some contact with one another. On 13 November she died in Auschwitz. Treinle Wechsler was born in Aschbach in Bavaria on 19 November 1872. She was the daughter of a teacher, Samuel Wechsler (1828-1888) and Bella Falk (1857-1913). They were a religious family. On 20 June 1899 Therese married Meier Rosenberg (1869-1912), from the town of Leer in Ostfriesland. The Meiers were a large Jewish family there. He had six brothers and sisters and many cousins in that town. Many other relatives lived in Ostfriesland and in the Netherlands. The elderly lady in the picture is Therese (Treinle) Rosenberg-Wechsler, with her children around her. The picture was taken in Leer in 1922. Meier and Therese had a shop in second-hand goods in Reimerstrasse, near the station. 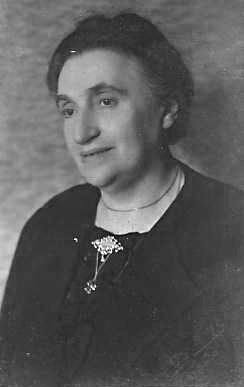 After Meier’s death in 1912 she ran the shop herself together with her nine children, especially her eldest son Sämmy Rosenberg (1900-1945). 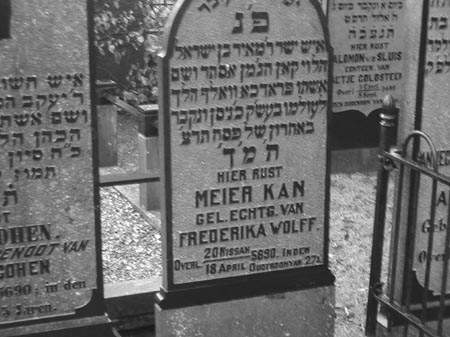 Her second son, Rudolph (1901-1986) became a teacher of religion and moved to Maagdenburg where he started teaching at the ‘Religionsschule’ and also acted as assistant-cantor and Rabbi in the synagogue. Therese’s other children were Elly (born 1902), Marie (1904), Lina (1906), Jette (1908), Carola (1909), Fritz (1910-1933) and Martha (1912), all born in Leer. Early 1938 life for the Rosenberg family became more and more unpleasant. Both Marta and Jette left for New York that year. Therese too left Leer to go and live with her son and his family in Maagdenburg, in an apartment in the synagogue. On 9 November 1938 the synagogue was destroyed by the Nazis. Rudolph was arrested and deported to Buchenwald. After his release two weeks later he took steps to move with his family to Rotterdam. Around that time his sister Marie lived at Hillegersberg with her husband Herman Messcher (born at Harlingen, 1907-1944). Before that time Marie and Herman had lived in Meppel in Emmastraat. Herman worked there at the skin stripping company of Hartog van Esso. Their children Martijn Arnold (1934-1944) and Frits (1936-1944) were born here. Their daughter Carola Therese (1937-1944) was born in Rotterdam. On 30 November 1938 Therese left Maagdenburg and settled in Rotterdam together with Rudolph, his wife Gerta and their two young sons. There they lived in an old hotel that had been converted into a camp for refugees. Gerta worked there as a servant and Rudolph taught the kids in the camp. Therese’s eldest son Sämmy also joined them. On 10 February 1940 Rudolph, Gerta and their two sons went to New York on board of a ship of the Holland America Line. Sämmy and Therese stayed in the Netherlands. In September 1940 Sämmy had to go to Westerbork and in November of that same year Therese had to move to Meppel, because the Germans had started to build the Atlantic Wall and did not want any Jewish priers. She first lived in Woldstraat and later moved to the boarding house in Molenstraat. In the night of 2 to 3 October 1942 Meppel policemen came to fetch her from her home. The next day she was transported to Westerbork by train. One of the neighbours heard her cry: ‘Mein Gebetebuch, mein Gebetebuch (prayer book).’ Together with a number of other families she stayed at Westerbork till the middle of 1944. Then Therese, Sämmy, Marie, Herman, Martijn, Frits and Carola Therese were deported to Theresienstadt. The whole Messcher family was sent to Auschwitz where they were all killed on 7 July 1944. Therese’s son Sämmy was deported to Auschwitz at the end of September 1944 and died in the satellite camp Czechowice on 2 January 1945. Therese herself died in Theresienstadt on 3 November 1944. Her daughter Elly also died in a concentration camp. She, her husband Benjamin Levie (1899-1942) and their son Jakob (1930-1944) left Leer in August 1938 for Frankfurt. In 1941 they were deported to Lódź. Benjamin died there and Elly and Jacob died in Chelmno in 1944. Five of Therese’s children survived the war: Rudolph, Lina, Jette, Carola and Martha. Rudolph, Jette and Martha built a new life in the US, Lina went to Palestine and Carola went to Argentina and later to the US. In 2006 Therese Rosenberg-Wechsler had 26 descendants in the US and Israel. 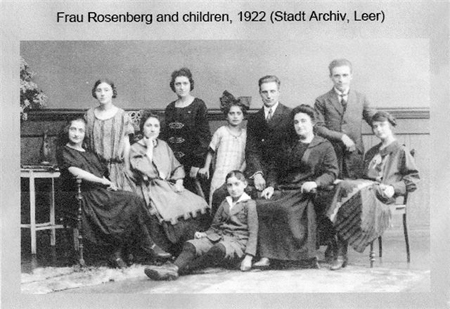 Therese had eight brothers and sisters: Jette Fleischman Wechsler, Rosa Marx Wechsler, Sophie Schloss Wechsler, Lea Schloss Wechsler, Berta Ster Wechsler, Emanuel Wechsler, Gisela-Gitta Loewy Wechsler and Abraham-Josef Wechsler. Many of their descendants also live in the US and Israel. At the beginning of the war Bina Veldman (born on 1 March 1892) also lived in the boarding house. She was not married and worked as a shop assistant in the fashion shop of Van Zuiden. Between 1 February 1941 and 1 October 1942 she left Meppel, probably because running a shop was made impossible for Mr. van Zuiden. By going into hiding she survived the war. A striking detail: a long time after the war she lived in the same Jewish home as Aaltje Wolf who was also from Meppel. There is still a picture of them dressed up for Purim. Hendrika Wolff’s boarding house in Molenstraat (2nd house from the right).